In training camp, you don’t get a lot of reps in the beginning. "Hey Coach, I've only gotten two plays all day, I want to play," I remember saying to my positional coach. Coach Gary Gibbs replied with something like, "Oh, you want to play? Let me talk to the Defensive Coordinator." I watched Gibbs go over to Coach Zimmer, who then said he would talk to the head coach. The next morning after I had voiced my opinion, in comes Bill Parcells. "Hey #56, Rookie," Parcells said to me. "You want to play?" "Sure, thats why ya'll drafted me, right?" "OK, but if you want to play, you're going to have to go against that guy," Parcells said, pointing into the crowd. When he pointed, it seemed like the Red Sea parted. All of the players moved out of the way, and guess who he was pointing at? 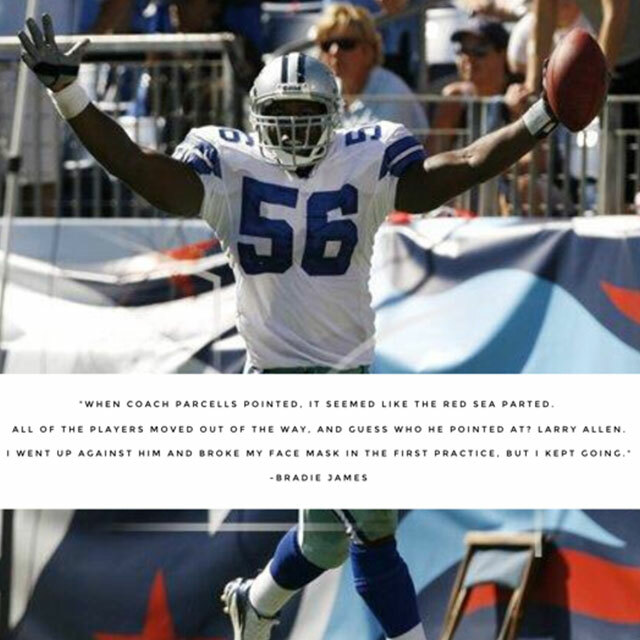 Larry Allen. Oh my goodness! I went up against him and he broke my face mask in the first practice, but I kept going. And that was my first experience in my 10-year NFL career. I missed the first rookie minicamp because we had a new coach that came in, and there was a league mandate that didn’t allow me to come in because I was getting my degree, so I had to wait. So, I get in late one afternoon, and we go straight to the weight room. I’m in the weight room lifting with all these other guys. I was on the bench press doing about 365, and I felt like I belonged just by lifting weights. But in walks Larry Allen. I knew him by playing and all that but I had never played against him or seen him, just heard stories. So he goes straight to the squat rack, and put 405 on and just starts squatting – no warm up or stretch or anything. I looked at him and said, 'OK, I can do that, I just gotta stretch and warm up.' Allen comes over to my area, and as I was continuing my weight training, I noticed all of these coaches coming down. All of them came in because Larry Allen put every plate at the bench press on the bar. Every plate. Never forget it, and I couldn’t believe it. He had so much weight on there that the bar was bending. He got under, two coaches on one side by the weights, two on the other and two lifting it up. He picks the weight up and bounces it off his chest and says, “One, two, three…” All the way up to six. It was crazy.